The Mountain Thrushes (Turdus plebejus) are also known as American Mountain Thrushes, Cabanisi's Thrushes or Mountain Robins. Mountain Thrushes are resident in the highlands of southeastern Mexico south to Panama. In Mexico, they are only found north to southeastern Oaxaca and southern Chiapas. The distribution continues south to western Panama in Chiriquí. 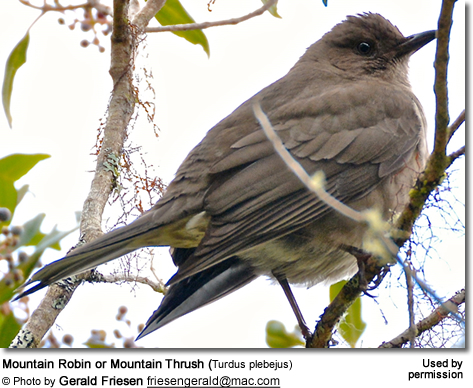 These large, dull-colored thrushes favor tall mountain forests - particularly those with oaks and many epiphytes and mosses. They will also visit adjacent open areas, woodland edges, as well as pastures with scattered, moss-draped trees. Physical differences between the subspecies are minimal and some suggest that species should be treated as monotypic (one single species). An intermediate between the northern and southern subspecies; often merged with differens. Plumage verk dark olive, darker wings and tail; slightly paler throat. Legs and feet are dark brown. 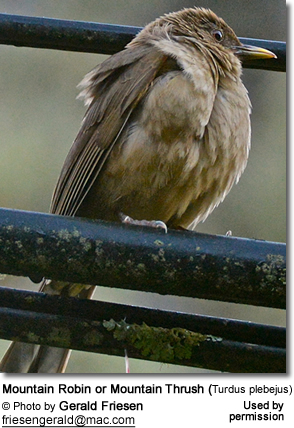 The juveniles have buff or cinnamon streaks on the head and upperparts; and cinnamon brown with dark mottling below. The Sooty Robins are blacker with orange bills, eye rings and legs. The Clay-colored Robins have yellow bills and a much paler plumage. The female Black Thrushes (Turdus infuscatus) can be identified by the browner (less grey) body and paler throats. Immature birds have yellowish bills. The immature male Rufous-collared Robins (Turdus rufitorques) have yellow bills and a darker plumage. The Mountain Robins feed on insects and other invertebrates, as well as seeds, berries and fruit. They forage on the ground and in trees. The Mountain Robins typically breed between March and June. They build large cup nests using mosses, and line the nests with soft plant material, such as grasses, bamboo leaves and rootlets. Their nests are generally placed in the dense epiphytes of trees, about 10 - 40 feet (3 - 12 meters) above the ground. A clutch typically consists of 2 - 3 blue-green, unmarked eggs. Their songs are described as mechanical monotone chip chip cher chip chip cher cher or cheechuchree-chichuchee; and their calls as high seee or whip.